Chernobyl Catastrophe: 25th Anniversary of World’s Worst Nuclear Accident | Democracy Now! AMY GOODMAN: It was 25 years ago today when a deadly explosion at the Chernobyl nuclear power plant in the former Soviet state of Ukraine led to what was then the worst nuclear disaster in history. It sent a cloud of radioactive fallout into Russia, Belarus and over a large portion of Europe. Fifty thousand people living in Chernobyl’s immediate surroundings had to be evacuated. A vast rural region became uninhabitable, and public authorities were forced to put restrictions on the sale and import of food to reduce the risk of radiation-induced cancer deaths among their populations. Children born in the plant’s vicinity continue experiencing high levels of birth defects, especially severe brain damage. In this clip from the 2003 documentary Chernobyl Heart, a nurse at a children’s care facility applies medication to the severely infected and mutated hands of a little boy. NURSE: [translated] I think he’s in danger of losing his hands. INTERVIEWER: [translated] Is there a relationship between radiation from Chernobyl and what is wrong with the kids you see? NURSE: [translated] I think so, of course. I’ve been working here for 19 years. I can definitely say that the children before were not as mentally deficient, and now they have more physical and mental handicaps. They were born with some kind of abnormality and were abandoned. INTERVIEWER: [translated] You seem like you’re about to cry. Are you always this close to tears? NURSE: [translated] I can’t handle this. I have two children myself. AMY GOODMAN: That was a clip from Chernobyl Heart, a 2003 documentary film by Maryann DeLeo. The film won the Best Documentary Short Subject Award at the 2004 Academy Awards. Chernobyl is one of only two nuclear accidents to ever receive a Level 7 classification on the International Nuclear Event Scale. The other was, just recently, Fukushima Daiichi nuclear power accident that occurred last month in Japan. Today, environmental activists are demonstrating on the Chernobyl plant to mark the 25th anniversary and raise awareness about the current nuclear fallout in Japan. A nuclear expert from Greenpeace International in Russia explained why he’s participating in the protest. TOBIAS MUENCHMEYER: [translated] The Chernobyl catastrophe began exactly here 25 years ago. Six weeks ago, we saw a Japanese atomic catastrophe. What else are we waiting for? We urgently need to move to alternative sources of energy: wind, solar energy, the use of biomass energy. All this exists. It just needs a political will to move to alternative energy sources. AMY GOODMAN: A full quarter of a century after Chernobyl, the world is faced with a new nuclear catastrophe, this time in Japan. To discuss further what took place 25 years ago, we’re joined by Dr. Janette Sherman. She edited the book Chernobyl: Consequences of the Catastrophe for People and Nature. She’s joining us from Arlington, Virginia, joining us from PBS station WETA. We’re also joined by Dr. Jeff Patterson. He’s the immediate past president of Physicians for Social Responsibility. He visited Chernobyl after the disaster. He joins us from Washington, D.C.
Jeff Patterson, let’s begin with you. Talk about what happened 25 years ago today and what you saw when you went there afterwards. DR. JEFF PATTERSON: Well, a month after the accident, which irradiated a huge area — and the radiation went worldwide — I was in Germany, East and West Germany, touring and lecturing. I was in Marburg, a university town much like Madison. After my lecture, the mayor of Marburg came up to me and said, “What should I tell people? I get different answers from my radiation specialists, from my medical doctors, from my engineers. I don’t know what to tell people.” And I think this is the situation today. Two years after Chernobyl, I was in Chernobyl, and while we were touring around the plant, where they were still washing down the streets, there were men grading dirt up that was highly radioactive. They wore no respirators, no protection whatsoever. And I asked my guide, “How are you monitoring the radiation levels on these people?” And he said, “Oh, they all wear badges.” And I said, “Where’s your badge?” And he opened his coat and said, “I guess I left it at home today.” And this is exemplary of what was done after Chernobyl, where 600,000 to 800,000 workers came in and sacrificed some of their lives for the cleanup. And the records on many of those workers are simply gone. They’ve disappeared. I spoke recently with a physicist who was involved with monitoring the radiation at the plant at that time, and he said these workers had no protection. They wore paper masks, that they often didn’t wear. And he said he’s tried to find the records in the Ukraine, and they’ve simply disappeared. And he himself did not know how much radiation he received at the time of that accident. So I think this is an example of the confusion, the difficulty in monitoring radiation, and the history of the nuclear industry, which has been one of secrecy, cover-up and minimization of the damage that occurs. AMY GOODMAN: Let’s go to Janette Sherman. Dr. Janette Sherman, describe what happened on this day 25 years ago in Chernobyl. Even place it for us physically. 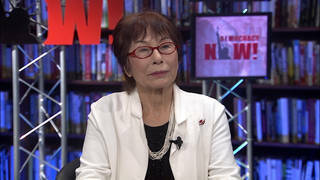 DR. JANETTE SHERMAN: Well, there had been a decision to do a test on the reactor, and they — it was started on the day shift, and then it couldn’t happen, so they postponed it to the afternoon shift, and finally it was undertaken on the night shift, where people were not prepared, and they achieved a runaway nuclear reaction, which they could not control, and had an explosion that we’re contending with ever since. We still — even though it’s 25 years later, we’re still dealing with the radiation at Chernobyl. It’s still leaking out of the reactor. The so-called containment that was built around it is crumbling. And there is really no way to control this. There is a proposal to build a steel shell that will come from two different directions and close over the top of the reactor, but the funding hasn’t been achieved yet, and it’s a long way off before this will ever be built. AMY GOODMAN: Dr. Jeff Patterson, the casualties of Chernobyl 25 years ago are wide-ranging. Some say 4,500 people died. Others — well, a study by the New York Academy of Sciences in 2009 concluded the death toll from Chernobyl was as high as one million. What are the figures? DR. JEFF PATTERSON: Well, I think we do have a wide range of figures, and I don’t think we know for sure. When we look at the Hiroshima data, this Hiroshima bomb was a one-time dose of radiation that occurred 65 years ago, and we’re still seeing new cancers and new deaths from that. And again, that was a one-time dose of radiation. This radiation goes on and on, because its nuclides that are put into the atmosphere are now in the ground and water and continue to expose people. So, we honestly don’t know the end of this experiment, and we’re going to have to watch it for literally hundreds of years to see what’s going to happen. I think that it’s safe to say that the results are far worse than certainly the conservative estimates. And the other issue is, the Hiroshima data has cost billions of dollars to accumulate. And we’ve been looking at that for 65 years, and we still don’t have the end answer to that question. So, here we are with far more people exposed to continuing radiation. This is truly an experiment that we’re not going to see the end of, and that the results of which will be visited on our children and grandchildren for generations to come. AMY GOODMAN: And this figure that the Chernobyl blast was 400 times more powerful than the atomic bomb dropped on Hiroshima, could you explain that? DR. JEFF PATTERSON: Well, it’s a little difficult, because the bomb was exploded a thousand feet in the air, and so it was a one-time dose of radiation. The thermal energy initially killed about 100,000 people, and subsequently 100,000 or so more have died from the effects of the radiation and other injuries. And so, the force of the blast is essentially what we’re talking about here and also the radiation effect. And I think the fact is that more radiation has been released from the Chernobyl plant, and that’s, I think, where the figure of the 400 times more powerful comes from. AMY GOODMAN: On the eve of the 25th anniversary of the Chernobyl nuclear disaster, President Dmitry Medvedev of Russia reiterated his commitment to the development of nuclear energy. PRESIDENT DMITRY MEDVEDEV: [translated] The recent events have reminded humanity that we can’t take things easy and that, when making important decisions, it is necessary to take into account a whole range of issues which in the future might affect safety. Of course, I mean the situation around the Japanese Fukushima 1 nuclear plant. At the same time, we should not block development. The peaceful atom remains the cheapest and, in general, environmentally the cheapest type of energy. AMY GOODMAN: Late last month, President Obama unveiled a new energy policy, seeking to reduce the use of foreign oil while reaffirming also his commitment to nuclear power. PRESIDENT BARACK OBAMA: It’s important to recognize that nuclear energy doesn’t emit carbon dioxide in the atmosphere, so those of us who are concerned about climate change, we’ve got to recognize that nuclear power, if it’s safe, can make a significant contribution to the climate change question. […] And we’re going to incorporate those conclusions and lessons from Japan in design and the building of the next generation of plants. But we can’t simply take it off the table. AMY GOODMAN: Dr. Jeff Patterson, your response? DR. JEFF PATTERSON: Well, I think nuclear power, nuclear energy, has three poisonous Ps, and those are pollution — and we’re certainly seeing the example of that now at the 25th anniversary of Chernobyl. That pollution occurs all along the fuel cycle, from the time we dig it out of the ground, the tailings that are left and expose people to radon, to the proliferation of nuclear weapons, to the production of fuel, and then we don’t know where to bury the waste or what to do with it. And now we’re seeing the catastrophic release of radiation once again, which happened at Kyshtym in Russia, happened in Chernobyl, and now is happening in Fukushima — and will happen again. And so, pollution is the first thing that is the poisonous P.
Second is price. And as Medvedev said — he claims that this is the cheapest form of energy. It’s by far and away the most expensive form of energy. When we figure in the results of these disasters and the cost to people’s health, the economic loss, the agricultural loss, the Ukraine, in the initial days of this, spent a sixth of their national budget on Chernobyl. And Belarus and the Ukraine are still spending five to seven percent of their national budgets every year to deal with the Chernobyl accident. If we figured all of that in to the cost of nuclear power, nuclear power becomes extremely expensive. As Dr. Sherman mentioned, the next sarcophagus that they’re proposing to build over the nuclear power plant, they’re estimating will cost $1.1 billion, and they’ve only raised $800 million for this now. It’s already three years behind time in terms of being built. And so, the question is, will this ever get done, because the cost of this is so much. The cost of building a new nuclear power plant is so expensive that, chances are, none will be built, because nobody wants to fund them. And the third poisonous P is proliferation. Nuclear power and nuclear weapons go hand in hand. Medvedev talked about the peaceful atom that was designed by Eisenhower. Well, it’s out of the peaceful atom program that has come nuclear weapons for many countries. And we’re seeing the example of that in Iran today. So, these are deadly parts of the nuclear experiment that we are conducting today that, in my opinion, is a highly unethical experiment. AMY GOODMAN: An evacuation zone study is being released by your group, Dr. Jeff Patterson, Physicians for Social Responsibility, that shows there are many nuclear plants in the United States where there are much denser populations than there were around Hiroshima or Chernobyl. Can you talk about the news conference that you’re heading off to right after you leave Democracy Now!? DR. JEFF PATTERSON: Yes. We’re doing a presentation in which we’ve developed a map that you can click on and see in your area how near you are to a nuclear power plant and then look at the evacuation zones out from that power plant. And for example, in New York, there’s a nuclear power plant 19 miles from New York City. So we’re talking about, with an accident like Fukushima, potentially evacuating 20 million people. Well, if the Japanese are having trouble evacuating the folks from around their plant and are now changing the, quote, “safe” levels of radiation that children can be exposed to in the middle of the ball game here, imagine what it would be like in New York City when this accident might occur and attempting to evacuate those people on a summer day, let alone in the middle of a snowstorm, in New York City. So I would invite people to look at this and consider what this means for their lives. The mayor of South Miami, Florida, just wrote a letter, when, after the Fukushima accident, he was trying to find out what the evacuation plans are for South Miami, which is 16 miles from a nuclear power plant. And he, as mayor, can’t find out what will happen and feels that the plans are totally inadequate, including the plans to distribute potassium iodide. He tried to find out from the county how many tablets of potassium iodine were available, and they wouldn’t tell him. So I think that the lesson in this is that wherever this happens in the world, it happens to us all — the radiation from Fukushima is here, we’re still experiencing radiation from Chernobyl that has gone worldwide, and so no one is isolated from these accidents — and that no matter where it occurs, whether we blame the technology in Russia, whether we blame the tsunami, that we are all totally inadequately prepared to deal with this. We are attempting to manage the unmanageable. And so, we need to rapidly move away from this and rapidly move away from nuclear weapons in the world. AMY GOODMAN: Dr. Janette Sherman, you’re known for a prophetic paper you wrote some six months before the Fukushima catastrophe, where you wrote, “Given [the] profound weather effects (earthquakes, floods, tsunamis, [etc.]) human fallibility, and military conflicts, many believe it is only a matter of time before there is another nuclear catastrophe.” Can you talk more about this and what you feel needs to be done? I mean, you talked about this before Fukushima. You edited the book Chernobyl, the book that looks at the consequences of the catastrophe for people and nature, putting together a number of Russian writers about what took place. And you also talked about how the Russian government dealt with it and how governments should deal. DR. JANETTE SHERMAN: Well, we clearly need, as a society, to say no to nuclear power, because there is no way to control it. And as Dr. Patterson points out, these catastrophes will continue, and we can’t — we, simply, as a world society, cannot deal with them. When a nuclear reactor explodes, the radiation goes around the entire hemisphere. It is not confined to where the people live — or where the accident occurred. The effects are ubiquitous across all species: that’s wild and domestic animals, birds, fish, bacteria, viruses, plants and humans. So the effects are extremely serious, and they last for generations. We’re terribly concerned about Belarus, where only 20 percent of the children are now considered healthy. So, what do you do with a society if 80 percent of your population is sick? Who are going to be the artists and the musicians and the scientists and the teachers, if your population is not well? We need to stop the use of nuclear power. We have other sources: conservation and solar and wind and biofuels. We need the population to rise up and say, “No more nuclear.” It’s not going to work, and it will just be a matter of time before there’s yet another accident, such as occurred — is occurring at Fukushima Daiichi. We know now they still do not have this accident under control, and it’s still releasing massive quantities of isotopes. And it’s going to be a disaster for the Japanese population, but also it’s spreading around again the northern hemisphere. AMY GOODMAN: You had talked about the liquidators in Chernobyl, the people who went into the plant. AMY GOODMAN: And you also look at those in Japan and what it means for them. Explain their jobs and what it is they’re exposed to. DR. JANETTE SHERMAN: Well, in Chernobyl, the liquidators were largely recruits. They were generally healthy young men and women, generally between the ages of 18 and 39 or so. Already, by 2006, 15 percent had died, and now the data that is arriving to us is about 90 percent of the 800,000 recruits have bad health. And their children are particularly adversely affected. Now, we don’t know if the cleanup workers in Japan are being protected or not. Certainly, the Tyvek suits are not going to protect them from external radiation. The biggest concern for the — is the inhalation and ingestion of radioisotopes, which are being released on a constant basis. We see that the cleanup workers in Japan are wearing respirators, but whether they are adequate or not, I have no idea. We’re also not being given information on the levels of radiation to which they’re exposed. Now, what they did in Chernobyl, they would send in some people to do some particularly dangerous work for maybe 15 minutes or half an hour and then take them out, because they had received a lifetime dosage. We don’t know what’s occurring in Japan, particularly, and whether the workers are being adequately protected. It’s very, very, very important to keep adequate records on exposures and the effect of the workers and make them publicly available, certainly not by the name of the individual person, but certainly the data needs to be available and transparent so scientists can follow what is happening to these people. The problem within Chernobyl was that they released almost no data for three years, and it was very, very difficult to reconstruct what was happening. And as Dr. Patterson pointed out, many of these records have disappeared. And indeed, many records of nuclear workers in the United States have disappeared, and it has — workers have a very hard time finding what their exposures were, even when they knew what their job description was. AMY GOODMAN: Well, Dr. Janette Sherman, I want to thank you for being with us, specialist in internal medicine and toxicology, edited the book Chernobyl: Consequences of the Catastrophe for People and Nature. And Dr. Jeff Patterson, as you head off to the news conference of Physicians for Social Responsibility, could you just describe Chernobyl to us today, what is it like? DR. JEFF PATTERSON: Well, it’s an area 30 kilometers in circumference that is totally out of bounds to humans. And no crops are grown there. Some people have moved back in. Large areas of the earth has been scraped off, trees cut down. And all of that earth has been buried in trenches. And now, as they are attempting to build the new sarcophagus, they’re finding high levels of radiation in the ground with machinery that was buried immediately in the area. There are graveyards with tanks, buses, machines, that are highly radioactive, that are just sitting out in the open air. And interestingly enough, a recent report showed that the cesium levels around Chernobyl and in this zone and other zones have not diminished in the way that they predicted that they would. And so, they don’t know whether this is coming from cesium that’s coming up through the soil, whether it’s perhaps coming from new cesium that’s being blown into the area. But clearly, the unknowns are far greater than the knowns in all of this. And this is an experiment that we’re carrying out with the unknowing and unconsenting irradiation of huge populations of people around the world. We’re now seeing, for example, in Japan, raising the bar, allowing children to be exposed to levels of radiation that previously were restricted for nuclear workers. And in my opinion, this is unconscionable. It’s like being in a ball game and in the seventh inning deciding that one team is losing, and so they say they’re going to change the rules in the middle of the game. These levels were set for a reason. And that’s because radiation is not good for you, and there is no safe level of radiation. And so, to now change the rules of the game, again, is another unconscionable part of this terrible, cruel, poisonous experiment that we won’t know the end result of for hundreds of years. DR. JEFF PATTERSON: Thank you. AMY GOODMAN: — of Physicians for Social Responsibility, which is holding a news conference today to release a new report.